A fascinating behind-the-scenes look at the world of Hasidim. 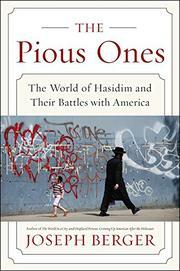 Longtime New York Times reporter Berger (Displaced Persons: Growing Up American After the Holocaust, 2001) puts decades of experience in reporting on Hasidim to work in this balanced, intriguing account of the American Hasidic population. Surviving the Holocaust, the Hasidic brand of Judaism managed to flourish again in New York and other American cities, and it is now booming in population. Hasidic characteristics—including strict observance of Jewish laws, modest yet conspicuous dress, limited contact with non-Jews and intersectarian disagreements—provide much fodder for the author, who brings Hasidim to life for lays reader through personal stories based on extensive interviews. Ranging from a Holocaust survivor who managed to leave 2,000 descendants at the time of her death to a Hasidic nonconformist with an underground blog, Berger’s work explores a wide spectrum of Hasidic lives and lifestyles. Assuming very little previous knowledge from readers, the author masterfully explains all aspects. Thus, even a reader new to Judaism can learn about the Hasidic world without getting lost. For more expert readers, Berger provides personal depth as well as topical breadth. Filled with plenty of material for further discussion, the book does a service by dispelling many myths, and Berger provides an avenue for wider public understanding and acceptance of Hasidism. The author also points to flaws within the Hasidic community and in their relations with the outside world: deep-seated gender issues, the hushing-up of abuse cases, extortion and intimidation by self-proclaimed modesty police, and the avoidance of certain regulations and zoning laws. Through Berger’s solid research and approachable writing, readers will gain a clear, well-rounded understanding of who the Hasidim are, where they came from and where they are going as a people.